Last time, we took a look at the slinky, one of the most popular and long standing spring-based toys to enjoy genuinely worldwide popularity. However, springs are used in a huge array of other recreational products too, so in this latest blog we&apos;re taking a look at another old favourite; the pogo stick. Pogo sticks have been around for a very long time, and they have seen various incarnations during those years. 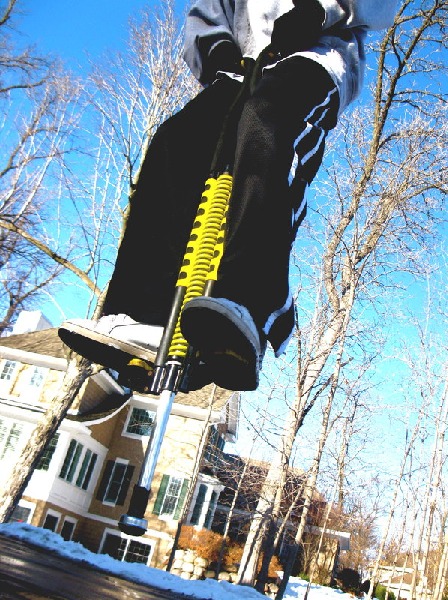 So without further ado, here are 10 things about pogo sticks that you never knew before. 	The first time that compression springs were used at the base of a stilt was in 1891, and Georg H. Herrington of Kansas was the first individual to create such a device. 	Pogo sticks are a close relative of spring stilts. 	George Hansburg of Germany was the pioneer of the true pogo stick patent in 1957, and it was Hansburg who elected to fashion the pogo stick from metal, having noted the poor durability of previous wooden equivalents. 	There is no consensus as to where the name &apos;pogo&apos; comes from. One of the most popular claims derives from the story of a farmer who was unable to afford shoes for his daughter, Pogo, leading to her procuring a spring-powered contraption to jump through the mud. 	The longest amount of consecutive pogo stick jumps was recorded in 1990, and stands in the Guinness Book of Records at 177,737 jumps. 	The furthest distance a person has ever travelled on a pogo stick is 37.18 kilometres. 	Many variations of pogo sticking have been tested over the years, including (incredibly) underwater pogo sticking. 	In recent years, Extreme Pogo has arisen to bring forth a competitive &apos;sports&apos; style element into pogo sticking. The enhanced pogo sticks used in this pastime can propel their users over 10 feet into the air. 	In 1962, then health minister Enoch Powell led a campaign to raise the profile of the health benefits that a pogo stick could offer. 	Despite modern improvements, the fundamental design concept behind the pogo stick has always remained essentially unchanged. Pogo sticks are a popular innovation, but of course they simply couldn&apos;t function without the spring that is intrinsic to their success. It is this spring that provides the recoil that is needed to launch the user into the air, after all. At European Springs and Pressings Ltd, we manufacture and design springs for a wide variety of applications, some of which are relatively light-hearted after the fashion of a pogo stick, and others of which are used in very serious capacities like the offshore industry. Whatever project you need springs for we are undoubtedly able to help. To find out more, please don&apos;t hesitate to contact us by calling +44 (0) 208 663 1800 or send us an email at info.bec@europeansprings.com.